I’m working on attaching the cooling hoses to the iron yoke magnet today. I attached the outlet hoses and ran a quick test to make sure that I did indeed have the outlet hose connections. I attached a water bottle on a hose to the open connection pointed at in the picture below and forced water through. The water exited at the labeled water out connection. The exit connection will ultimately have a green hose on it like the manifold on the left. Do not confuse this with the red hose the arrow appears to be pointing at in this picture. 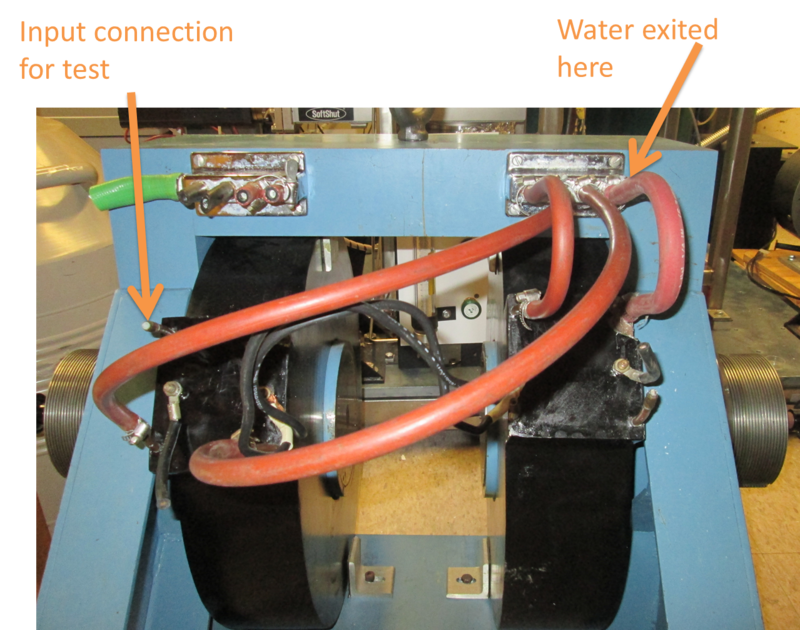 This means that the water flow is indeed from the upper hoses to the lower hoses on each set of coils, and not across from the left to the right connections on either the top or the bottom. Note to readers: When the tone of the text wavers into the bossy and possibly semantic, or obvious, these are notes for myself in a few weeks when I don't remember what's going on anymore.